Safety is important to Barbara, so when she flew to Los Angeles with her 6 month old, she reserved a car at an agency that had made strong promises about their infant car seats. Exhausted after a long flight, she struggled for two hours to find a seat that could be installed safely in her rental car and finally drove away with what she thought was the best of the bunch... a dilapidated car seat so old that the manufacturer and California State Law both recommend that it be destroyed. 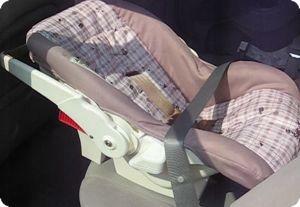 Child seats can save lives and prevent injuries. They have proven so effective that Californians are required to use them in their own cars and rental car agencies are required to provide seats in good working order to customers who request them. Most agencies charge $10 per day for the service, a hefty profit when you consider that seats can be purchased at retail for under $60 and can be used for up to five years by-law. Even after agreeing to pay the daily rental fee, Barbara could not get the information or parts she needed to install a seat safely from Advantage Rent A Car. She repeatedly asked employees and managers for the missing parts and manuals, but the rental agency just didn't care. The on-site manager ignored her complaints, saying that liability prevented him from offering any help. Advantage Rent A Car's corporate office never responded to her letter of complaint. This isn't the first time parents with young children were trapped at Advantage with no safe way to get to their destination. My regular readers will remember that we were confronted with a stack of dilapidated and unsafe car seats at Advantage Rental Car's San Diego location back in December. After ABC ran a story about our experience, Advantage promised that they had "performed a company-wide inspection of all ... car seats available for rental" and that "...only carseats that meet or exceed state guidelines are now available for rental". They also said that they had instituted tough new standards that would ensure it never happened again. We felt good about these changes and blogged about it. The irony is that Barbara read this story and chose to rent from Advantage because of their new safety policy. After a terrible experience and failing to get a response from Advantage, she contacted me. Shocked to hear another story of blatant disregard for basic safety and California State Law, I flew down to Los Angeles to see for myself. Los Angeles International Airport is one of the world's busiest airports, and when I arrived, the agency was crowded with customers. Many were families with young children headed to Disneyland or Los Angeles beaches. Curious about the condition of the car seats, I asked to rent both an infant seat and a toddler seat. What I found was shocking and upsetting, especially after the company's strong promises about cleanliness and safety. The first toddler seat I was given had been bagged as if it had been cleaned, but it was visibly soiled and covered in crumbs. I returned it to the agent, who agreed that it was filthy, and handed me another (bagged) car seat. When I opened the bag, I smelled a strong stench of vomit. The pictures I took show that the seat was visibly soiled too. Neither toddler seat had a manual or the "locking clip" that would be needed to install it in some cars. Like Barbara, I found that none of the infant car seats had the base that is included with car seats sold in retail stores. Like many parents, Barbara had never installed a car seat without the base. Without written instructions, she followed the pictures printed on the side of the seat and installed it using the car's seatbelt. Each time she tried it, the car seat was impossible to keep level and slid around on the seat. When Barbara did finally locate a seat with a base, it was so old that it did not even have a 5-point harness (standard on every car-seat sold by Babies R Us and other retail stores), but at least she could install it snugly in the car. She was shocked to find out later that it had been manufactured in 2000. California law mandates that it should have been retired in 2005. The infant car seat I rented was newer. Only two years old, it was nonetheless filthy and missing original parts. A bracket stuck out where a sun canopy used to be attached. Though the car seat had clearly been used with a base (which would have included the latch belt recommended by most safety experts) the base was nowhere to be found. The manual and locking clip were missing too, and though I sincerely tried to install the car seat safely with what was available at Advantage, I ultimately failed. Like Barbara, I asked repeatedly for manuals and was told that they were not available (most car seat manufacturers make manuals available on their websites, and Advantage's internal guidelines tell employees to print a new manual for the customer if the original is lost). A quick search through the other car seats available showed that most were in similar condition, though I was able to find two that still had their manuals. I finally told two different employees that I would put my daughter in the loosely installed seat, drive to the store to buy a new one, and return the car seat for a refund. Not only were they not upset that their equipment would put my daughter at risk, they gave me directions to a nearby store! When I returned the car, I spoke to the assistant manager. She told me that I must not be installing the seat correctly and insisted that it could be installed securely without the missing base. When I asked her for information on how to do it, she walked away saying that my money would be refunded. I'm glad that I didn't have a tired infant with me like Barbara did, after two hours of failed attempts to safely install a car seat, a callous response like that would have left us both in tears. Last week, I contacted the Head of Customer Service at Advantage Rent A Car and told her what I found. She sincerely apologized, saying that she thought they had addressed the problem and was as dismayed as I was to hear otherwise. She stated that she would follow up with the managers responsible for the Los Angeles location. I don't want any more parents to show up at a rental car location and feel trapped with no safe way to get where they are going. This is truly a topic where the network of parents can use the Internet and social media to spread the word faster and better than ever before. Help me get the word out to parents who don't know about the risk of renting a car seat. Tell your friends about it, and if you have a blog of your own, please share this story with your readers. During the coming weeks, I will follow-up with a few more stories on this... from my visits to other rental car agencies to stories from other parents. If you would like an interview or guest article on this subject, let me know and I will do my best to fill every request. Susannah on July 28, 2008 at 5:21 a.m.
You are amazing--I can't believe the time, money, and effort you have put into this. You are truly making a difference, and all parents will be benefitting from your efforts. Thank you from the bottom of my heart. Barbara on July 28, 2008 at 7:51 a.m. Thank you so much for sharing my story, Debbie. It really was an infuriating ordeal that left me feeling like I was being a bad mom for settling for a car seat that wasn't up to current legal standards. It was ridiculous that I had to make that choice after a long day of flying. I'm so glad there are people like you out there looking out for the rest of us. Hopefully this will result in some changes so that other parents don't have to go through what my son and I did. Thank you so much!!! Debbie on July 28, 2008 at 9:50 a.m.
@ Susannah. Thanks! Now that I'm at home with the kids I don't have time for volunteering like I used to, but my blog gives me a way to have impact on a few issues I care about. This is my way of giving back. @Barbara Thanks again for your tip. You absolutely were not a bad mom. Being a parent sometimes means trading off between different solutions... none of which is perfect. There's a legal and moral standard that the Rental Car Agencies are accountable for (not to mention the fact that Advantage made some pretty strong promises to customers about the quality and age of car seats they would rent). I want to thank you again for doing such a great job of documenting exactly what happened to you and taking photos of the seats. The strength of the information you provided was what made it worthwhile for me to fly down to LA and follow up on the story. Debbie on July 28, 2008 at 9:54 a.m.
LeftyMama on July 28, 2008 at 1:25 p.m. Thanks for the follow up! It is so scary to think that you could be stranded at the airport in a strange city, late at night, forced to choose between a risky ride to your destination or haggling w/ uninformed, uncaring staff at a rental car agency while your small children edge ever closer to meltdown. My first plane trip w/ my 1 yr old in Dec.07, we were going to a winter ski resort for the week & would not be driving while on there with our extended family. To save money & eliminate extra luggage (also preventing screaming fits from our baby who hated his carseat), we chose to have the baby sit on my lap for our flights. Our big concern was the 45 min 4WD Suburban ride from the airport to the hotel. The shuttle co. advertised free carseats for families traveling w/ toddlers, so we reserved one thinking, "Great, one less thing to haul." When the car arrived to pick us up on the curb in 30 degree snowy weather at 9pm in Salt Lake, I was surprised to see that the carseat was not installed. The driver told us that "due to liability issues" he wasn't allowed to help us with installation of this strange carseat that we'd never seen before. Our whole family of 10 was shivering in the dark cold as I struggled to hurry & get the seat tightly buckled up & adjusted to fit my son. I finally just crossed my fingers & hoped for the best, as I never was able to get the straps right. That ride was very tense for me as I kept one hand on the carseat at all times, bracing that I might have to (futilely) try to protect my child in a crash. It was the same deal on our return trip a week later, but at least I was prepared. As soon as the shuttle arrived (luckily during daylight), I went to work trying to set up the seat. This one was similar to our own at home & I was able to get it in fairly tight & with the right shoulder strap heights, etc. Still, there was no manual, clips, or specific information to help me as I stood in the snow working on the installation. Luckily, I had read a great deal of information on general carseat installation & knew some tricks on getting the seatbelts tight, etc. Having read of the horrible experiences here & after having my own, I have wondered if it would be less risky to try one of the compact foldable travel carseats. At least then, I would have a contraption with which I am familiar & I could already have the straps adjusted, etc. in advance. I found an Eddie Bauer portable that can easily fit into a suitcase & weighs only 4 lbs, but I haven't yet used it. For some reason, they're trying to sell this for $130 on Amazon now, but I ordered mine last year for under $50. Maybe they've been reading Delicious Baby, too? As our "regular" carseat at home, we use the Radian 80, which can fold a little bit (the seat folds up to the back), & we will probably take it on our next airplane trip, as our son will be too old to lapsit. Thankfully, he also has gotten over hating his carseat. Leslie M-B on July 28, 2008 at 4:04 p.m.
- the first car seat they gave us would not fit in the car at all. - employees would not help us install the car seat. - the seat was missing the locking clip. - the seat was not clean. - the parking garage was 97 degrees Fahrenheit. We struggled with different seats in this heat (with our baby son in the half-air-conditioned car) until we found one that mostly fit. I was furious. I suspect this isn't a problem restricted to Advantage. P.S. It was great meeting you at BlogHer! minnemom on July 28, 2008 at 7:33 p.m.
Debbie, thanks for continuing to bring this to people's attention. Although traveling with a carseat from home may not be convenient, at least you know how to install it, its history and safety record, and have the proper documentation. I used to think it was great that rental companies had carseats available. Your article makes it clear that there's a good chance you'll be putting your child in danger by relying on a rental carseat. becky on July 29, 2008 at 10:40 a.m.
Christel on July 29, 2008 at 5:46 p.m. Thank you so much for bringing this issue to light. Just a few weeks ago my family was stranded at a Budget airport location after midnight, with the employees telling me that even though I had reserved and confirmed the two child seats I needed, they only had booster seats for my 18 month old and three year old. At one point they also suggested I drive to Walmart and buy seats, even though that would have meant either leaving my kids and partner behind in the rental car parking lot in the middle of the night as the rental car location was closing, or driving them in unsafe seats over to the store (plus WTF did they think I was supposed to do with these two new car seats -- if I wanted to drag them on the airplane, I'd have brought my own to begin with). In short, the whole experience was appalling. It took me two hours (from midnight to nearly 2 AM) to complete the car check-in process, which finally ended with them scrounging up two not very clean seats for us to use. And it's not as if they were even attentive during that hellacious two hours -- I kept having to ask what they were doing and what was going on, since otherwise they'd say something like "you can go wait by the car and we'll bring you the seats" and then 20 minutes would pass while we stood in the dark waiting while they ignored us to work on other stuff. At least both my kids can go forward facing, I can't even imagine how much worse it would have been if we had needed an infant seat. Laura on July 29, 2008 at 6:04 p.m.
We too had a recent run-in with the rented carseat dilema. We were traveling to FL from KY with one lay-over and had our toddler and infant. So we had 3 tickets and were allowed only 3 pieces of luggage (plus a stroller gate-checked) included in our ticket price. Our toddler rode in his carseat on the plane, so we were already lugging one around multiple airports. We reserved a car through Budget and I was assured they had plenty of carseats available for our infant for only $50 for all 10 days of our trip. Our flight arrived in FL at 9pm and it took me and my husband about 40 minutes together to finally install one to our liking, though we were kicking ourselves for not coughing up the extra $25 each way to bring our own on the plane. Also, two years ago when we traveled with our infant son and checked his carseat it came back to us battered and missing the adjustable part of the carseat base. The rental employees also told us that they were legally unable to help install so as to avoid any liability if the seat failed. Which is fine, I understand the rental agencies don't want to accept responsibility for that sort of tragedy, but that late with two in tow in nasty humid heat it was frustrating. We kept fiddling with the seat throughout the week, putting the locking clip (thankfully included with it) in all sorts of places to make it tighter to the seat. I'm sure all the seats they offered us were pretty old, because the lables were faded and it was very hard to read the diagrams (without words) that showed how to install them. Next time I think we'll try using the carseat with the stroller and try to gate check both to help save money, though the next time we travel will be with three children requiring carseats. Maybe we'll just rent a minivan and use our own carseats and drive from home. Hilary A on July 29, 2008 at 8:49 p.m. Very interesting story! You should submit it to http://consumerist.com/ It's a great site where shoppers get to tell their tales. Rent a car Timisoara on July 29, 2008 at 11:31 p.m.
Menashe on July 30, 2008 at 5:53 a.m.
With three kids six and under, I've given up on getting what I need from rental car companies. Whenever I travel with the kids, I take a double stroller carry bag, put all three car and booster seats in it, and check the bag. When I arrive at my destination, I have my own car seats. Once, the airline (JetBlue) lost the bag, but was able to lend me three seats in very good condition and delivered my seats later that evening, when they arrived. As the kids are getting older and we travel with less, I've found that a booster seat can fit in a large and reasonably full suitcase. We can now usually spread the three booster seats in our regular luggage without needing a separate bag. Even with the separate bag (and lately, additional charges), it's still cheaper and safer than renting car seats. Vivian on July 30, 2008 at 7:31 a.m.
Lindsay on July 30, 2008 at 7:57 p.m. I rented a carseat, two years ago at a Hertz. It was one of the most frustrating experiences of my life. I had flown from Washington, DC, to Portand, Oregon. I was alone with my two year old daughter, and didn't want to wrestle with a carseat on the plane. So I reserved one in advance online, along with a Subaru wagon. Easy, right? No. When I showd up, they said, "Oh. We're all out of them right now, you'll have to wait until one come back in." Of course, I was outraged, (and my kid was at her wit's end) but they shrugged their shoulders and said, "There isn't one- what do you want us to do? There's a Toys R Us 5 miles away, you could take the bus and get one." Riggght. WIth all my luggage and freaking out baby. I don't think so. Plus, I didn;t want to pay hundreds of dollars for a quality carseat, when I had a Britax at home. I probably should have- because after an hour, the counter came up with a dirty, dingy infant carseat- for my two year old. They acted like they found the holy grail, and couldn't understand why I was so upset. "It's a carseat!" I'm ashamed to admit that I wedged my poor baby into it- luckily, she was small for her age- and just got the heck out of that airport. When we got home, I wrote Hertz a letter, received no response, and will never, ever use them again. RookieMom Heather on July 31, 2008 at 10:25 a.m.
yikes. I agree with Whitney and will help you spread the word. Totally scary. Debbie on August 2, 2008 at 10:53 p.m. I want to take a minute to thank everyone who shared their stories. I hear enough stories like these to know that this problem isn't limited to just one rental car agency or one location, so please keep those stories coming in. Jenny, Bloggess on August 3, 2008 at 6:47 a.m.
Clare on August 4, 2008 at 8:29 p.m.
Wow. This made my skin crawl! Why do they get away with crap like this? Martin on August 11, 2008 at 2:53 a.m.
As a non-US citizen, your experiences make me worried, but at a loss what I should do. We are planning to travel to the US in Sep/Oct 2008 with our baby daughter (then 9 months old). After spending some days in NYC, we plan to drive out to the Great Lakes for a wedding of friends. We will need to rent a car, and we would want a safe seat for our daughter. From the stories that you tell, it may seem better to buy a seat while in NY and be independent form crappy car rentals. Would you say that's a good idea? If so, how do we find a shop with a good car seat. I don't know the American market at all. I don't know brands, outlets etc. SkylarKD on August 11, 2008 at 8:17 a.m. Thanks for writing about this, Debbie! And thanks for the comment about the Sit 'n' Stroll that you left on my blog. I'll have to check it out for our next trip! To your readers: Our bad car seat experience was with Hertz in Hamilton, Ontario, Canada. Never again! Despite their claims of cleanliness, safety and qualified technicians, we had a pretty horrible experience, and had to use a visibly unsafe seat on Canada's busiest highway before we could get a replacement! Debbie on August 11, 2008 at 9:26 a.m.
becky on August 11, 2008 at 1:54 p.m.
Nicci on August 11, 2008 at 2:30 p.m.
We take our car seat with us on the plane. It's a Safety First Uptown and it is a light car seat. I put it in the stroller and put a bungee cord through the forward-facing belt path and then put my son in the car seat. Very easy to move around the airport. I've traveled by myself with this set-up. My son is comfortable in the car seat on the plane and I know how to install it in the rental car. After reading this story and others, I wouldn't rent a car seat, as it seems more hassle than bringing your own. Amanda Gleave on August 12, 2008 at 1:53 a.m. I recently travelled to Florida from the UK and rented a car and 3 car seats from Avis at Miami International Airport. The lady had been trained in fitting seats and helped us install them. Half way through, she was unhappy with one of the installs and requested we change cars, as 3 seats would have been unsafe in that particular car. While I was perfectly happy with the seats and installs, the next day we purchased new seats at Walmart and returned the rental seats. We now have seats that we can bring with us on return trips to the USA, rather than bringing our UK seats. A friend of mine actually had a tour of the Avis Depot at Heathrow Airport in England, and Car seats are a big deal for them - all have to be checked and washed etc before being rented out. It would be interesting to hear of others who had used seats from Avis in particular. Rose on August 15, 2008 at 2:36 a.m. I too had a bad experience renting a car seat from Alamo for my then 6 month old in Hawaii. The car seat they claimed was an infant seat, was meant for a baby at least 18 month. It was way too big for him and not meant to be rear facing. The entire drive from the airport to hotel, I was so nervous about my baby's safety. They totally refused to help install it or give instructions. Luckily, the valet guy at our hotel took the time to secure the car seat, even though it was not done correctly as it was definitely missing something and after reading your blog, I think the car seat was just old. Next time we travel, we're definitely bringing our own car seat. Your blog is great. I love all the detail you put into it. Maggy Johnson on January 29, 2009 at 6:23 a.m.
You are great - I can not believe that this time you so much of himself. You specify sufficiently clear how things stand and fathers and mothers will be very grateful. Iwant from you to accept my thanks. Peter on March 23, 2009 at 6:04 p.m. Unfortunately this is typical behavior of companies that do not care... when someone such as yourself manages to bring media attention upon them they are all apologetic and swear to fix the problem immediately, and this makes them look good on camera. Then they do nothing, knowing that the media rarely bothers to follow up, since it's less newsworthy the second time around. But tell the press anyway, if they have a slow news day they may run a piece since it would be fairly easy. Steve Peterson on May 4, 2009 at 9:59 p.m.
Becca on September 17, 2009 at 8:23 a.m.
How horrific! Thanks for sharing. My oldest is almost 30 and frankly, we didn't even bother with a car seat when he was born. But cars, drivers and roads were all different then. By the second one, we knew better. Fortunately my children are grown and my nieces and nephews come with great parents who transfer car seats with the kids. The tricky thing is what am I going to do when the grandchildren come along? We've worked so hard to be able to travel when they come so we can help bridge the gaps in the generations and distant working families :( We may have to drive until they are school age, but then what? I hope this situation is much improved very soon. Thank you all. Michael on November 26, 2009 at 12:45 a.m.
Calvin on March 24, 2010 at 7:12 a.m. It's a life not a toy. http://www.allcreditcards.info on May 20, 2010 at 2:04 a.m. I probably should, because after an hour, counter a dirty, dirty baby carseat-came with their two year old. They acted like they found the holy grail, and can not understand why I was so upset. "It is a carseat!" Stephen on May 27, 2010 at 8:50 a.m. Thanks for all of your work. I was just searching the web to find which car rental companies were recommended for good car seat rentals and found your story on another site. After following the links (and watching the news reports from 2008) I've definitely made up my mind that we won't be renting a car seat from any rental car company. My wife and I (along with our 7-month old daughter and dog) are moving from FL to Seattle at the end of next month and we're planning a stop in NY to visit family while our things cross the country to Seattle. So, since we'd be having our 7-month old and our dog with us on the plane trips to NY and later to Seattle, we figured that we could just save some baggage and simply rent the carseat. However, after these reports, there's no way we'll be doing that. Good thing we have a Radian 80 that folds a bit (and you can purchase a storage bag for it that has back-pack straps)! Even though it's heavy, it's worth her safety. Thanks for exposing this. Just wish it was more widely known....can't imagine how many parents are unaware of this until it's too late. Steve corwin on June 20, 2010 at 4:58 a.m. I will definitely spread the words! Genevieve Koesling on July 4, 2010 at 10:15 a.m. I own Travel BaBees of San Diego. We are a baby gear rental service. I recently completed a 40 hour car seat safety and installation with SafeKids. I attended the class with the CHP. You count on our company to have pristine and safe car seats. I can also install and teach you how to install your car seats correctly. I am in constant contact with CHP car seat coordinator for California who can vouch for my expertise. We are the only company that is certified and background checked. You can truly trust our company. judy on March 23, 2011 at 11:06 a.m.
thanks for putting the information out there! I was actually looking to rent a car seat for my 13 month old, because I didn't want to have to deal with checking it in and out. But now that I know I don't really have an option, I'll get a car seat travel bag instead! marlon on April 18, 2012 at 5:35 a.m. Unfortunately this is typical behavior of companies that do not care... when someone such as yourself manages to bring media attention upon them they are all apologetic and swear to fix the problem immediately, and this makes them look good on camera. Get Away Car Hire Ltd on February 8, 2014 at 4:01 a.m.
Alltrans Training Services on February 8, 2014 at 4:28 a.m.